The world’s Sauvignon Blanc capital has much more to offer than its signature wine. New Zealand’s Marlborough wine region is the country’s vinous powerhouse, responsible for approximately 75 percent of all production. But until recently, it has lagged behind other parts of the country in amenities available to international visitors. Blenheim, the main town, reflects its agricultural roots, dotted with tractor supply and hardware stores. Small lunch counters that feature different Asian cuisines or meat pies are sprinkled throughout downtown. But to truly experience Marlborough, travel into the surrounding countryside and explore the region’s many cellar doors. Ranging from small corners of wineries to expansive restaurants, these winery outlets are the heartbeat of the region. Some of the best places to eat in Marlborough are the restaurants located at winery cellar doors. Most offer their own wines at prices close to retail, but they’re open only for lunch. The restaurants at Wairau River and Allan Scott are both particularly good. Arbour, which serves dinner only, is the region’s best standalone restaurant—Chef Bradley Hornby and partner Liz Buttimore offer three- and five-course menus, plus a “many” course option. 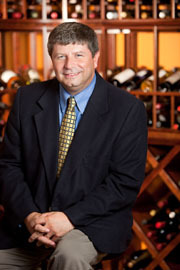 Straddling the cellar door-restaurant boundary is Hans Herzog. The casual bistro is open year-round, while the formal restaurant serves dinner November through May. In Blenheim and within walking distance from downtown, Chateau Marlborough rates high among the international wine press for its comfort and reliable Wi-Fi. Located downtown is the venerable Hotel d’Urville, set in a refurbished bank. Marlborough Vintners Hotel is further inland and offers vineyard and garden views. Private cottage and house rentals are another popular option. You can also stay in one of the many waterfront hotel choices in nearby Picton, where the ferry from the North Island docks. The flat Wairau River valley offers easy cycling, or head up into the Wither Hills to burn off extra calories. Rent from Bike Fit Marlborough. The Omaka Aviation Heritage Centre houses Sir Peter Jackson’s collection of WWI aircraft, including an unparalleled collection of Red Baron memorabilia. Sunday mornings, visit the Marlborough Farmers’ Market for the ultimate in local produce. Marlborough never gets too cold, and a dusting of snow on the Wither Hills can add a photogenic touch to your vineyard shots. If the idea of another restaurant meal is just too much, head for Renwick Pie Shop, home to some of the best pies in New Zealand. These are savory pastries, with options ranging from steak-and-kidney pie to curry, all for less than $10. Marlborough never gets too cold, and a dusting of snow on the Wither Hills can add a photogenic touch to your vineyard shots. But be warned that some cellar doors and restaurants are closed or may have limited hours during winter (approximately the end of June to mid-September). Most of the wineries lie along the main east-west roads to the west of Blenheim. Big brands on the valley floor include Villa Maria and Wither Hills. The Brancott Estate Heritage Center provides fine views of the region. For fans of sparkling wines, a stop at No. 1 Family Estate is a must—Frenchman Daniel Le Brun has been making New Zealand bubbles here for close to 20 years. Nearby Huia Vineyards operates biodynamically and makes a solid sparkler of its own, along with first-rate Gewürztraminer and Pinot Gris. Another small cellar door worth a visit is Te Whare Ra, where you can try one of the region’s few Syrahs. The Awatere Valley is an attractive subregion just south of the main valley. There, visit Peter Yealands, with its baby-doll sheep and mobile chicken coops. Download the winery’s app and take a self-guided tour through the vineyards. Sauvignon Blanc is the main attraction. They’re fresh, zingy and loaded with scents and flavors of tropical fruit and fresh greens. Increasingly, you’ll find wineries making alternative styles fermented and/or aged in oak vessels. Other aromatic white wines are also popular: Riesling, Gewürztraminer and Pinot Gris perform well. Chardonnay and sparkling wines are less common, but also good. Almost all of the red wines you’ll find in Marlborough are Pinot Noir, which handles the cool growing conditions well. Valley-floor Pinots tend to be lighter and more aromatic, while bigger, sturdier wines come from the heavier soils of the southern valleys.